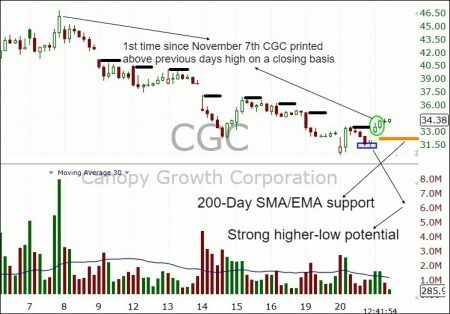 Canopy Growth Corp (TSE:WEED) (NYSE:CGC) (FRA:11L1) staged an impressive comeback this morning, raising the rest of the cannabis complex along with it. 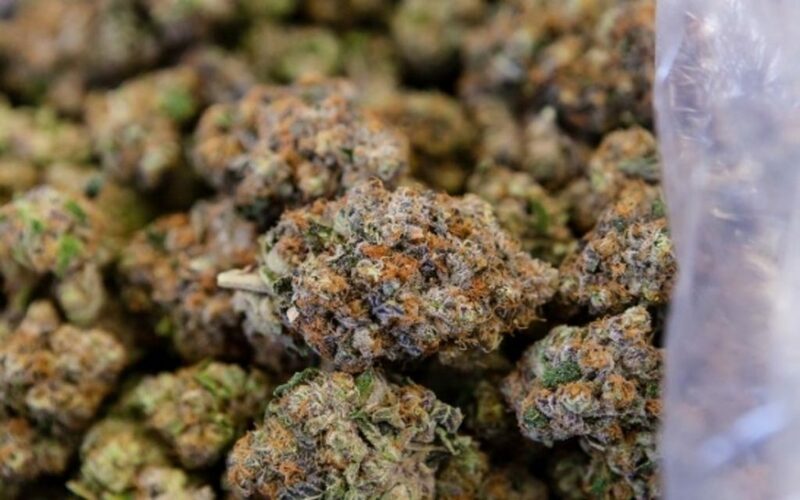 Constructive price action in both CGC and Horizons Marijuana Life Sciences Index ETF (HMMJ) give hope that the furious selling dogging the sector has—at least temporarily—abated. Although most risk assets are doing well, cannabis stocks are particularly buoyant. It all begins with sector leader Canopy Growth, which blasted through its 200-Day moving average ($32.28) on-open, and never looked back. Currently, CGC is higher by $2.15 to $34.31 (↑6.68%), almost twice that of the broad sector as defined by HMMJ (↑3.57%). Most importantly, Canopy Growth closed above yesterday’s high on an hourly basis, making a discernible high-low scenario likely. That doesn’t guarantee the stock won’t continue selling off in the coming days, but it does give investors a respite from the constant pounding unleashed on the stock. Prior to today, CGC hadn’t printed a closing high above the prior days high since November 7th—nine sessions ago. Assuming risk assets don’t capitulate in the coming days, we’ll be looking for the 200-Day MA to provide a nice backstop for the expected hourly higher-low to form. However, any closing low above $31.18 would technically qualify. Some notable buying is also occurring in some beaten-up junior names of interest. We look forward to hearing upcoming details of that transaction in due course. Certainly, the rally in cannabis stocks hasn’t been constrained to a particular class. Everyone is participating in uniform fashion across the spectrum. Before we get too excited about the nature of today’s rally, some important qualifiers of note. Sector benchmark HMMJ is still trading below its 200-Day MA ($18.85), while Tier-1’s Aphria and Aurora Cannabis still have ground to cover to get there. Volumes are also light ahead of U.S. Thanksgiving, suggesting the action is driven more by a soft ask than robust buying. Still, investors will gladly take the constructive action witnessed in Canopy Growth and associated securities. It sets the stage for higher-low base building within the sector, perhaps culminating in a stronger bullish impulse ahead should everyone join the north side of ‘200’.